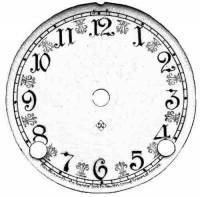 Description: 2-piece porcelain dial for Ansonia china clocks. Black on a white background. 4-1/16" outside diameter x 2-3/4" distance between winding arbors. Made in Asia. Arabic numerals. 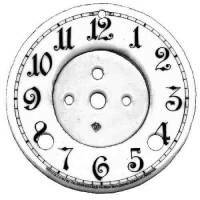 Description: 1-piece porcelain dial for Ansonia china clocks. Black on a white background. 4-1/16" outside diameter x 2-3/4" distance between winding arbors. Made in Asia. Arabic numerals. 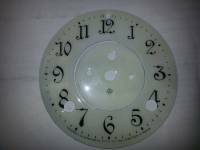 Description: 2-piece porcelain dial for Ansonia china clocks. Black and red on a cream background. 4-1/16" outside diameter x 2-3/4" distance between winding arbors. Made in Asia. Arabic numerals. 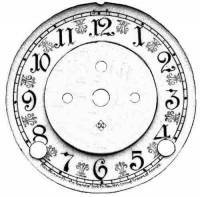 Description: 1-piece porcelain dial for Ansonia china clocks. Black and red on a cream background. 4-1/16" outside diameter x 2-3/4" distance between winding arbors. Made in Asia. Arabic numerals. Description: For statue clocks. 4-3/4" outside diameter. 2-3/4" distance between winding arbors. Black on a white porcelain background. 2-piece set. Made in Asia. Arabic numerals. Description: For statue clocks. 4-3/4" outside diameter. 2-3/4" distance between winding arbors. Black on a yellowish/ivory porcelain background. 2-piece set. Made in Asia. 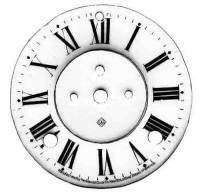 Roman numerals. Description: Porcelain Vienna ring fits many clocks. 5-3/8" outside diameter x 3-3/8" inside diameter. 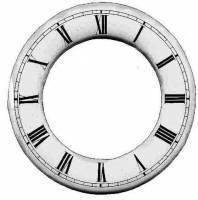 Roman numerals , yellow in color. Made in Asia.